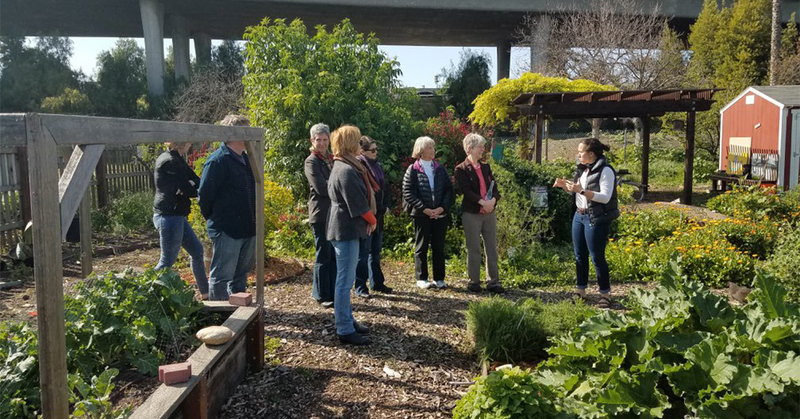 Vicki’s Garden at Steele Lane School in Santa Rosa has been supported and nourished by contributions from Slow Food Russian River for over a dozen years. Our financial contributions help pay the salary of a consistent and committed garden coordinator and assistant – essential components for longevity of any school garden. I attended a gardening class recently along with Karen Preuss, co-leader and photographer. Todd Reed, the garden coordinator, and Vicky Kumpfer, his helper, shepherd a first grade class into the garden. A sweet boy calls out “a bed”. The first graders mix in the bone meal, chatter, and, most important, work. Kids really do love meaningful work! Soon the bone meal is thoroughly mixed and Todd brings out a tray of garlic starts. Each child is given a garlic start which they plant with great love and care. They will harvest the garlic and add it to the tomato sauce made from tomatoes they grow for the pizza they will make in the outdoor pizza oven – a complete learning circle. Vicki’s Garden is one of the oldest in Santa Rosa. It was started in the early 1980’s by Vicki Lockner, the principal, who, along with other dedicated staff, volunteered time. It has evolved over time with the help of Slow Food Russian River and Santa Rosa Sunrise Rotary. Todd emphasizes that he and Vicky can teach everything in the garden – math, science, language. In Todd’s view it is of great importance that kids learn where their food comes from, which most have no idea about when they first enter the garden. Vicki’s Garden is, in truth, a sacred sanctuary for low income students who live in apartments or condos with no green. The majority of the kids are not white which means, especially in these times, that they are vulnerable. Fear is a backdrop of their daily lives. There are no cell phones or I-pads here! I have been our liaison with Steele Lane for most of my time with Slow Food Russian River. As an organization we do plenty of work every day to help preserve our local farmers and to remind people of the importance of eating Good, Clean and Fair food. In my humble opinion, our support of Vicki’s Garden is our most important work. You also can always visit the garden as well. Just stop by and take a look and talk with Todd if you are lucky. Your heart will be filled with joy. The address is 301 Steele Lane, Santa Rosa. So glad to see there is a place like this including kids into the process of gardening. West Steele is a great place for this to take place and I’m glad there are ways to keep kids involved in these types of activities. Thank you so much for sharing! Thanks for your thoughts, Billy. I am the main connect between SFRR and Steele Lane. I feel overwhelmed by the innocence and hope these kids have – and grateful to be part of giving them something green to nourish their souls. When I was growing up we were outside all day long – never in the house on a computer. One of my main worries about the next generation is what it means to be so disconnected from the natural world. Vicki’s Garden gives t hem a link every school day.